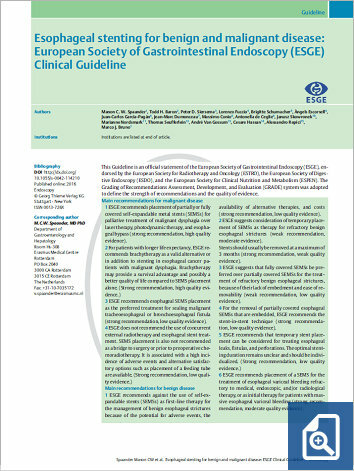 3 ESGE recommends esophageal SEMS placement as the preferred treatment for sealing malignant tracheoesophageal or bronchoesophageal fistula (strong recommendation, lowquality evidence). 2 ESGE suggests consideration of temporary placement of SEMSs as therapy for refractory benign esophageal strictures (weak recommendation, moderate evidence). Stents should usually be removed at a maximum of 3 months (strong recommendation, weak quality evidence). 4 For the removal of partially covered esophageal SEMSs that are embedded, ESGE recommends the stent-in-stent technique (strong recommendation, lowquality evidence).